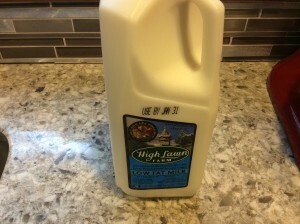 At Springdell during our winter share we are fortunate enough to receive our milk from our friends at High Lawn Farm in Lee, MA. Check them out at www.highlawnfarm.com. 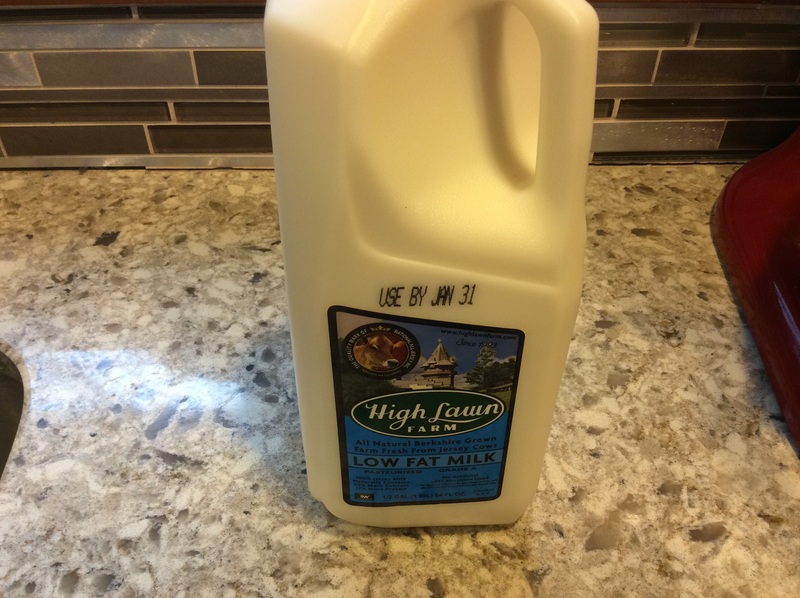 So if it’s lowfat milk, chocolate milk, half and half or another selection, we are fueling our bodies with nutritious local milk all through the winter. Milk is, for me, a product that is very obvious when it is fresh and local, you can really taste the difference! Milk is wonderful for our bodies. It is one of the best sources of calcium and is filled with vitamin D, which naturally helps our bodies absorb the calcium. Milk is a helper for our strong bones and teeth. Milk helps keep us hydrated while improving our vitamin intake. All in all, keep drinking friends! In order to produce so much milk we can enjoy, cows eat about 100 pounds of food a day and enjoy up to 50 gallons of water a day too! You love the zucchini breads, and the zucchini muffins, etc, but these bars add shredded coconut and a light cinnamon glaze to bring zucchini to a new level! This delicious treat comes to us from fellow Springdellian Mira G’s collection of family recipes. Thank you for sharing, Mira! Unless you have a from scratch recipe, this one requires a stop to the market for some popping fresh biscuits. It’s a deviation from all local ingredients, but for me, this is a limited case where convenience wins. If you’d rather skip the biscuits, the gravy stands up over hash or eggs. The recipe is simple, and the gravy is hearty! This recipe has many flexible ingredients, what you put in as a filling is up to you! A mandolin slicer is great for slicing the sweet potatoes evenly, making for a tastier crust. This is a lovely way to prepare cube steak, a true “meat and potatoes” meal, and the final product is so tender and delicious. The mushrooms and onions in the gravy are optional but highly recommended. Roasted acorn squash and mashed potatoes make great set of sides for this one. Just a quick simple and flexible method for cheese sauce, which goes great on just about everything. It’s listed for broccoli, but certainly is ready to blanket other vegetables as well. Enjoy! This is officially a favorite in the Anderson household. If you have a food processor, it’ll make short work of the crust, but if you don’t, a fork and a knife will get the job done, too. This recipe was originally adapted from a Cooking Light berry galette recipe, so the crust is perfect for a flexible filling (though peach is our favorite so far). Try it warm or cold with a dollop of freshly whipped cream. Prepare a pie crust, fill it with springtime goodness, and you’re off to the races with this flexible recipe. Mozzarella House cheeses go great with the springtime veggies in this dish, not to mention the cheese and garlic sausage. If you’re looking for a way to get uninterested folks to eat sweet potato, look no further! This pie was gone in one sitting, with the young potato-haters coming back for seconds. I followed this basic recipe with a few tweaks, microwaving instead of boiling the sweet potatoes, and cutting the sugar back by about 1/4 cup. The mixture was a tiny bit chunkier than smooth, but i have no regrets, as the flavor of the sweet potato really popped! A great usage of the whole wheat pastry flour we sometimes see in the winter CSA. If you prefer a bit of sweetness to those unsweetened dried cranberries, try tossing them in a splash of maple syrup before baking! You will go crazy for this one. I think a little fresh mint in the summer and you could please and impress just about anyone!